January 2009, at the Toronto Boat Show and later at the Salon du bateau de Montréal, Richelieu Boat Works Inc introduced a redesign interior for the Bras d’Or 11. The improvements include two water tight lateral compartments, adding tremendously to the already excellent buoyancy of the boat. 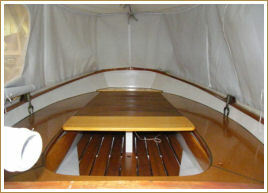 A mahogany extension has been added alongside the edge of the lateral compartments in order to support seven panels which are completing with the cover of the front storage and the movable center seat, a platform with a surface equivalent to a double bed. When not in use, the panels are stored and attached alongside the centerboard case.